Rich in texture and undeniably urbane, Agusa’s latest offering is a sublime collection of beautifully crafted and exquisitely executed compositions. The progressive – or are they psychedelic? – Swedish instrumentalists’ self-titled third album continues their seeming quest to ever expand their horizons, and the result is a majestic body of work which is undeniably individualistic and overtly organic in its creation and presentation. My first thoughts were that ‘Agusa’ brings to mind elements of Jon Lord’s ‘Sarabande’ album – a particular favourite of mine – albeit without the orchestra, and then I realised I’d drawn the same comparison with its predecessor, 2015’s ‘Två’. 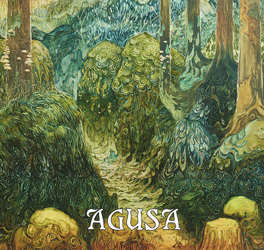 ‘Agusa’ does see a change in outlook though, with five songs this time around instead of just two. The (relatively) shorter material still allows the five musicians – guitarist Mikael Ödesjö, organist Jonas Berge (since the album replaced by Jeppe Juul), flautist Jenny Puertas, bassist Tobias Petterson and drummer Tim Wallander – to demonstrate their undeniable talents, without, as progressive musicians are wont to do, meandering too far from the path. The material still gives plenty of scope for individuality, with songs that build up a relentless, identifiable groove before throwing baby and bathwater out the window and cutting loose, allowing the band members plenty of freedom to express their prowess. To my mind ‘Agusa’ is heavier than its predecessor too, although ‘Sorgenfri’ and the mid-section of opener ‘Landet Längesen’ is about as fast as it gets. ‘Agusa’ is a colourful and opulent masterpiece, painted on a huge, expansive canvas. It’s not so much an album as a musical kaleidoscope, for which its creators should be highly commended.